Though I've professed a love of horror movies (many times), I also blog a lot about one of my other favorite forms of media: the novel. 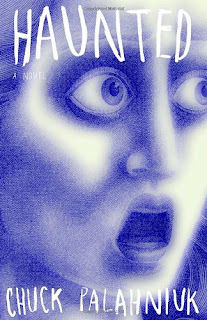 Just in time for Halloween, The Line Up posted a list of 9 underrated horror books to check out. I'm only familiar with one item on the list, but I have a great story to go with it that I've surprisingly never blogged about! One of my favorite authors is Chuck Palahniuk, who is best known for writing Fight Club. He's written many great books that can be a little difficult to read at times, because of the graphic and unusual situations in which his characters find themselves. For instance, he was inspired to write one of his books after being asked to testify at the sentencing hearing of the man who killed Chuck's father. The death penalty was being sought, and Chuck found himself in a difficult place, wanting justice for his father but not wanting to feel that he had taken a life himself. He wrote Lullaby, in which the lead character discovers a story that will kill the listener. Not only does the protagonist struggle with (and misuse) his newfound power, the power falls into the hands of others who misuse with less struggle. In fact, they discover that just thinking through the story around someone can kill them. It gets weirder, of course. But the book on the list linked above, Haunted, is probably one of his most graphic yet. The book is actually a series of short stories, that are connected because each character is sharing his/her story at a writers' retreat. I had the pleasure of meeting Chuck when I went to a reading of Haunted at Old Orchard Mall. Chuck has garnered a strong following thanks to Fight Club, and by the time my friend and I arrived, they had already passed out almost 150 numbers to people for the book signing after the reading. Yes, the number was our place in that line - the reading was at 7 or 8 pm, and we finally met Chuck around 1am. I had not expected him to stay until the end of the night, and I had immense respect for him as a fellow writer when they announced partway through the night that Chuck would not leave the building until everyone who wanted a book signed made it through the line. There were still others behind me, so I can't imagine how late he stayed. The best part of the story, of course, is the reading itself, where Chuck read the short story referenced in the article, "Guts," a story so graphic there are urban legends about people fainting during the reading. I won't say much, except to say the character who told this story poured his guts out, figuratively and literally. The reading had been advertised for many weeks, and one hopes that the people who scheduled the reading were familiar with the material, or at the very least, Chuck's writing. So, you can understand why Chuck was surprised when, as he was about to start the reading, he heard the sounds of children. He stopped, looked around, and said clearly into the microphone, "Hey, any parents in the store, you should probably know that this material is not appropriate for children. You may want to finish up your purchases and head out." He waited a moment, and read. A few minutes later, more sounds of children, and again, a pause and a strong warning from Chuck. He did that at least once more. A few weeks later, I met the assistant manager of the store through a mutual friend, and he informed me that Chuck had been banned from Barnes & Noble, because, "You can't read that type of stuff there!" I never did hear if he was banned from all Barnes & Nobles, or just that one.